As a stylist and salon owner I am frequently asked for a review of hair care products. 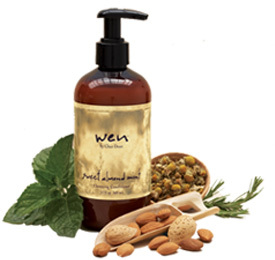 Lately, I have been getting a lot of questions about Wen by Chaz Dean, a line of hair care products that you subscribe to and receive monthly. As described on their website it is purported to be “A 5-in-1 formula, this one product takes the place of your shampoo, conditioner, deep conditioner, detangler and leave-in conditioner.” It’s other claim to fame is that it is free from sodium laurel sulfate, commonly used as a lathering agent. Recently, I had a new client that had been using the Wen products for three months. The results were disappointing to say the least. His naturally curly hair was so dry it felt like straw, and he had build-up on his scalp that was causing terrible dandruff, dryness and itchiness. It was impossible to comb before I did a treatment to remove some of the build-up. The reason for all of this is that unfortunately, these products contain Amodimethicone – a non-water soluble plastic that builds layer upon layer on the hair and scalp. Any product that claims to be a 5 in 1 is suspect in my book. You need a separate cleanser and an appropriate conditioner that is balanced appropriately for your hair type. Not everyone is missing moisture in their hair – some hair requires a bit more protein or a balance of both. At $30 per month, it is also a costly alternative to traditional shampoo and conditioner – that’s a lot of “conditioning cleanser” to go through on a monthly basis. Personally, I prefer botanical products free of dimethicone or amodimethicone, and parfumes (artificial fragrances derived from petrochemicals) such as Phyto or Simply Organic, or John Masters Organics. I hope you will look beyond the advertising and closer at the ingredients and ultimately, of course, the results.